The thumnail photo photo of Captain Dodgson has been provided by Charles Fair <charles.fair66@gmail.com>, to whom we are very grateful. Select the thumbnail image above for a larger image which opens in a new window. 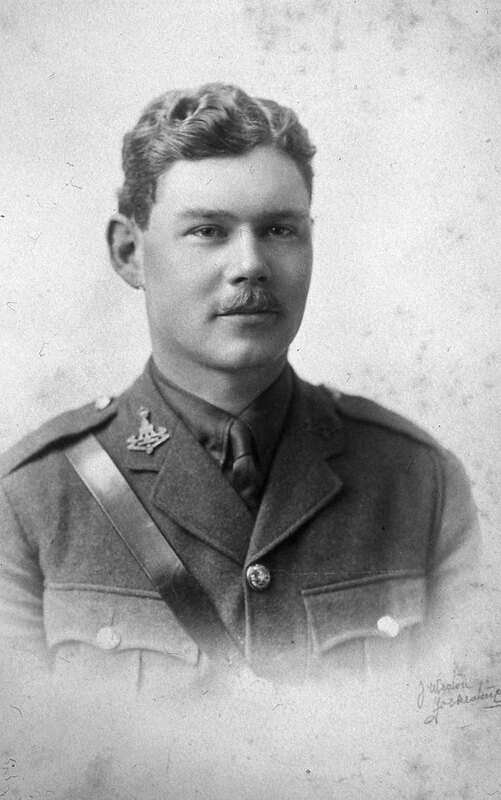 Below is a photo of Captain Francis Dodgson from the Marlborough College Roll of Honour. 8th Battalion the Yorkshire Regiment. Son of Henley F. Dodgson, of Bovingdon, Herts. Educated at Marlborough College and Trinity College, Cambridge. Killed 10 July 1916. Aged 27. Buried SERRE ROAD CEMETERY No.2. Also commemorated on the Trinity College, Cambridge, War Memorial. "Son of H F Dodgson Esq. of Frognal Rise, Hampstead, was born on May 10th 1889 and was at Marlborough College (B.3) from 1904 to 1907. He was in the Gym VIII of 1907. He went to Trinity College Cambridge where he took his B.A. in 1911. He volunteered for service with the 8th Battalion Yorkshire Regiment. He was promoted Captain in 1916. He was killed in action leading his Company at the third and successful attack on Contalmaison. July 11th 1916." "Francis Dodgson was born in Sheffield in 1890 (sic) and was educated at Marlborough College followed by Trinity College Cambridge which he entered in 1908. 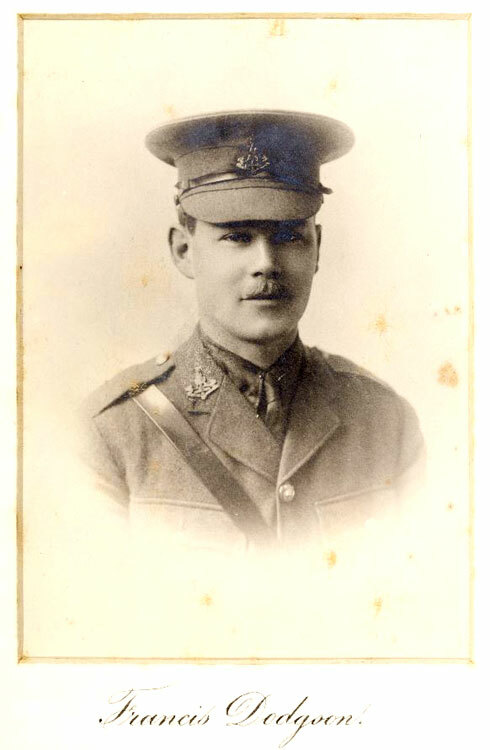 An original territorial officer of the 8th Battalion he is listed as a Lieutenant with “C” company in September of 1914. He arrived with the battalion in France on August 26th 1915 at Boulogne. They were first in the trenches at Bois Grenier south of Armentieres in October of 1915 and in the spring of 1916 were fighting at Gouay Servins and in the Angres sector. They moved down to prepare for the Somme offensive in late June. Francis Dodgson and his battalion were not involved on the first day of the Somme battle but came into the line for an attack on Horseshoe Trench on July 5th 1916. This attack went in at 6-00 p.m and by later in the evening the trench was secured. July 8th found them in trenches in front of Becourt Wood where the roof of the battalion HQ was blown in causing casualties. Contalmaison village was the next objective and Captain Dodgson and his men assembled in Horseshoe Trench late morning on July 10th. The advance towards Contalmaison began at 4-50 p.m. on July 10th when the 8th Battalion scrambled out of Horseshoe Trench. Five hundred yards from the village heavy machine gun and rifle fire from the front and left flank and then unexpected fire from the rear caused many casualties among the Yorkshires. Late in the evening the village of Contalmaison did fall to the British troops. Captain Francis Dodgson was killed in this action on July 10th 1916 at the age of 27, just weeks before his planned wedding to Miss Marjorie Secretan. Francis Dodgson is buried in Serre Road No2 Cemetery, the largest on the Somme. He is also remembered on Bovingdon War Memorial and in the local church are plaques to both him and his brother Guy who died in 1918 with the Hertfordshire Regiment. A third brother Phillip also fought and survived the war. Today just to the west of Contalmaison village stands a private memorial to Captain Dodgson (erected by his mother) and interestingly his original wooden grave marker can be seen at Salisbury Cathedral. A great deal of information on the life of Captain Francis Dodgson, and his career with the 8th Battalion the Yorkshire Regiment, is told in "Marjorie's War" by Reginald and Charles Fair, published by Menin House and available from Amazon Books.